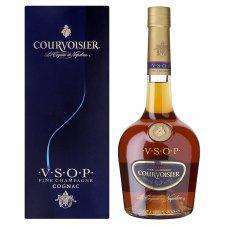 The 70cl Courvoisier VSOP Cognac normally retails at £31.39 at Sainbury's. Now with £10.00 off, it's reduced to £21.39. I was in Sainbury's in Nottingham yesterday and bought myself one as a treat. Went down to £20 last year around Xmas but still a great price. True story, I posted it last year Here. This is still a very good price given inflation etc. Just to let you all know that according to Sainsburys. If you order a home delivery and the items are not in store they will simply not deliver them. They won't let you know beforehand by phone or email. You could wait in especially and they will simply not bother to contact you even afterwards. I know this because I waited in on two occasions for two separate orders and when I rang the customer services they just didn't want to know. They just said that this is the policy !!!!!!! This is quite possibly the finest Cognac you can get for under £50 IMO. Easily my favourite spirit, so hot from me! This is quite possibly the finest Cognac you can get for under £50 IMO. … This is quite possibly the finest Cognac you can get for under £50 IMO. Easily my favourite spirit, so hot from me! Remy Martin and Hennessy VSOP do it for me but, Courvoisier VSOP comes a close third. I am going to scan the supermarkets tomorrow morning!! £31.29 is a ridiculous price to start with, who would have bought this at that price?? Every Christmas this is offered at most places around this price. Remy Martin and Hennessy VSOP do it for me but, Courvoisier VSOP comes a … Remy Martin and Hennessy VSOP do it for me but, Courvoisier VSOP comes a close third. I am going to scan the supermarkets tomorrow morning!! Both excellent drinks and easily in my top-five! I have quite a sweet palette so the Courvoisier really hits the spot for me. I got to try the 39 yr old brandy on sale in ALDI last week. Not bad at all for £25. Just to let you all know that according to Sainsburys. If you order a … Just to let you all know that according to Sainsburys. If you order a home delivery and the items are not in store they will simply not deliver them. They won't let you know beforehand by phone or email. You could wait in especially and they will simply not bother to contact you even afterwards.I know this because I waited in on two occasions for two separate orders and when I rang the customer services they just didn't want to know. They just said that this is the policy !!!!!!! Not only this but they will not refund the delivery charge even if none of your items were in stock!!! I think they are the worst home delivery service currently.